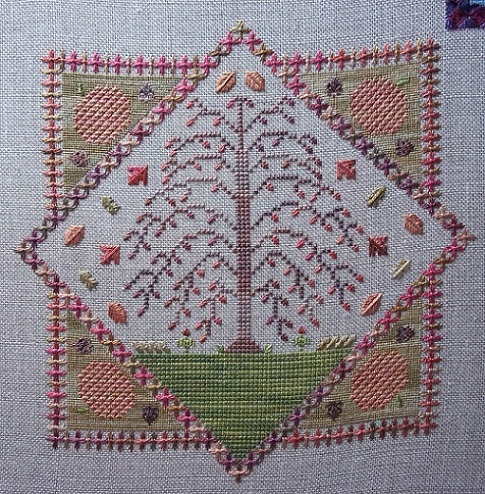 I finished stitching Autumn over the weekend. Well MY weekend anyway, which is Sunday and Monday. :) This is my favourite of the bunch so far, the colours are SOOOOO pretty. Thank you to everyone who commented on my question - I think you guys nailed it. I will be selling these as individual designs, and will post the instructions for "merging" them here on my blog with information in each design about where to find them. I've gotten a good start on winter, and I think it may surpass this one as my favourite when I'm done - I've only stitched a couple colours so far, but I have to say Valdani has some awesome blue-greys and silver-greys. Still a lot of work to do on it. I would like to add some more diagonal bands to the corners. Diagonal charting is always a challenge, but I'm finding it quite fun. Haven't decided if these bands will be monochrome as originally planned or possibly using the colour from the tree as well to tie things together. I also want to rechart the verse in a different style of alphabet, for me, something just doesn't feel right yet. 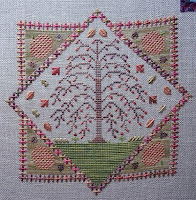 This was going to be a Nashville release, but if I can make everything click before then I will release it for the Online Needlework Show in October. I have to admit to one thing that is bugging me about this design and I have no doubt I will get a lot of flack about this from stitchers who decide to do the piece. Usually I try (I don't ALWAYS succeed) to limit the cost of materials when possible, even though I use a lot of the more expensive silks and linens, because I know not everyone can afford to spend hundreds of dollars on materials for a piece. Personally, I don't mind because I love the expensive stuff. ;) But I can understand how spending $100 or more for materials can be prohibitive for some which is why I always try my best to provide a decent conversion to DMC and/or any other materials I'm asked about. With this piece, I did really go all out, but with the changing seasons, it wasn't really possible to repeat most colours in multiple seasons and keep the feel I wanted. In total, with all four pieces and the borders, it will be 21 colours. Doesn't sound that bad, and if the skeins were average sized, like six or eight yards, you'd be using more than half of each so it wouldn't seem so bad. But I really have this feeling of guilt because these balls of silk from Valdani are HUGE. They're not six or eight yards, but 23 meters (about 25 yards). I don't know if I've even used a quarter of any one of them. So anyone doing these in the suggested threads is going to have a LOT of leftover thread - probably enough to stitch the design 3 times over - and that makes me feel guilty. That said, I wouldn't dream of changing the colours or brands to something else - I picked these because they are absolutely the best match to the picture in my brain and that IS my ultimate goal. It's a fine line really - some of the most fun projects to create are the ones where you just completely let go and play with colour and texture - but where do you draw the line and say "okay, maybe I'm going a little overboard here"? Maybe it's just me? While I'm a designer, I am still first and foremost a stitcher. I guess I see things from both sides and it's a battle that is and always will be constantly raging inside me. Perhaps you could follow these designs with some others that use the same colours. Just a thought.